The University of Toledo has completed its evaluation of duplicative courses and programs requested by the state legislature and is updating its academic offerings in response. The review of duplicative programs, which was recommended by Gov. John Kasich’s Task Force on Affordability and Efficiency, was completed through consultation with faculty committees, academic departments and college deans. The University’s Affordability and Efficiency Report was approved Dec. 18 by the UT Board of Trustees and will be submitted to the Ohio Department of Higher Education. Included in the report is the elimination of several undergraduate degree programs, including Athletic Training, International Relations and Affairs, and Business/Commerce. The undergraduate Athletic Training program is being phased out as the discipline is being transitioned nationally into a graduate-level training program by 2022 per its accrediting body, the Commission on Accreditation of Athletic Training Education. The UT Board of Trustees approved at the meeting a new UT Masters of Athletic Training Degree Program. The International Relations and Business Commerce programs are being eliminated due to low enrollment, and no current students will be impacted. An American Studies track within the Global Studies Program will replace the eliminated American Studies degree. The Digital Arts Program had not yet been pursued. • Changing the name of the Department of Foreign Languages to the Department of World Languages and Cultures to more accurately reflect the scope of what is being taught in the program. • A new Executive Masters of Sales Leadership Degree Program to meet an increased interest in the field and in specialized master’s programs in business. • Tuition rates for high school students who take UT courses through the College Credit Plus Program. Courses delivered on campus will be $140 per credit hour; online courses and those delivered off campus by University faculty will be $80 per credit hour; and courses that are off campus and taught by faculty-credentialed high school teachers will be $41.64 per credit hour. • The third phase of a campus infrastructure project that will replace older sections of the underground steam, condensate and chilled water lines on Main Campus. The $1.7 million project is funded primarily by bond dollars and is a continuation of infrastructure projects that begin in fiscal year 2010. • An agreement with the UT Police Patrolman’s Association to adjust wages in the final year of its collective bargaining agreement. The University and the union agreed to a one-time payment of $180 in January 2018, a 1 percent wage increase effective July 1, 2018, and the elimination of a sergeant pay range step level. Any parent knows how toys seem to magically multiply and take over a house. Do children need so many toys? A team of University of Toledo researchers studied whether the number of toys in a toddler’s environment influenced their quality of play. Their findings: Less is definitely more when it comes to creative, healthy play. 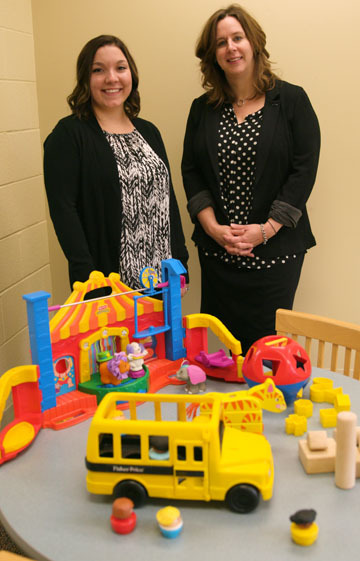 Research by Dr. Carly Dauch, left, and Dr. Alexia Metz found less is definitely more when it comes to toys and toddlers’ creative, healthy play. The results of the study come just in time for family and friends who are picking up holiday gifts for the children in their lives. The research, which will appear in the February issue of Infant Behavior and Development, suggests that an abundance of toys may create a distraction. Fewer new toys might be a better route this holiday season. When toddlers had exposure to fewer toys, they played twice as long with the toys they had and in more sophisticated ways, said Dr. Alexia Metz, the study’s lead investigator and a UT associate professor of occupational therapy. As the mother of 12-year-old twins, Metz has personal experience with the proliferation of toys phenomenon. Metz said she also had observed people worrying whether their toddlers had attention deficit disorder. Toddlers, by nature, are distractible, but she wondered whether their environment might be a factor in how they played or how easily distracted they were. Metz and her team of graduate students studied 36 toddlers from 18 to 30 months of age. The children visited the playroom lab twice. On one visit, the children played in a room with just four toys; on the other, they had access to 16 toys. The team charted how many times the toddler picked up a toy; how long they played with it; and how many ways they played with it. “When there were fewer toys, they played with them in more ways,” Metz said. In the 16-toy environment, many of the children played with 10 or more toys in the 15 minutes soon after they entered the room. By flitting from toy to toy, they didn’t take the time to explore the ways they could use each toy, Metz said. Fewer toys led to “higher quality play,” meaning the toddler stuck with the toy for longer and played with it in more creative ways. Instead of stacking or tipping a toy, they began to hammer with it or feed it or hide it. This increased exploration may support development of motor and cognitive skills. Michelle Imwalle and Brooke Ocasio, who also graduated in May, were the other graduate students involved in the project. This is also good news for families who may feel guilty for not being able to shower their children with dozens of toys. 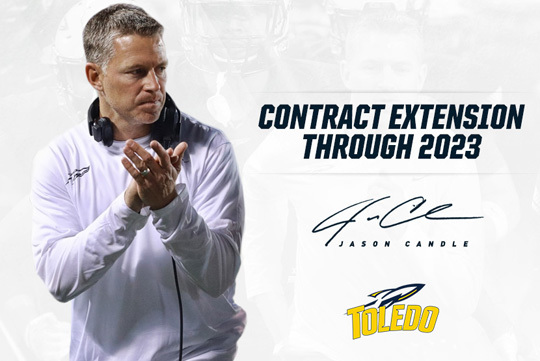 The University of Toledo and Head Football Coach Jason Candle have agreed to a contract extension through the 2023 season, UT Vice President and Athletic Director Mike O’Brien announced today. Candle, who was named the Mid-American Conference Coach of the Year in 2017, has guided the Rockets to an 11-2 record and a MAC Championship this season. Toledo won the MAC West Division title, its first outright division crown since 1998, with a 7-1 league record. The Rockets went on to defeat Akron, 45-28, in the MAC Championship Game in Detroit Dec. 2. It was Toledo’s first MAC Championship title since 2004. UT will play Sun Belt Co-Champion Appalachian State Saturday, Dec. 23, in the Dollar General Bowl in Mobile, Ala.
Candle’s career record at Toledo is 21-6. He took over the head coaching position at the end of the 2015 regular season, leading UT to a 32-17 victory over No. 24 Temple in the Marmot Boca Raton Bowl. In his first full season as Toledo’s head coach in 2016, he led his team to a 9-4 record and an appearance in the Raycom Media Camellia Bowl. Before assuming the head coaching position, Candle had been an assistant at Toledo for seven years, the last four as the program’s offensive coordinator. Candle, a native of Salem, Ohio, began his coaching career at his alma mater, Mount Union, in 2003. He was a part of four NCAA Division III national championships with the Purple Raiders, two as a player and two as an assistant coach. He joined Toledo in 2009 as a receivers coach, and moved to the offensive coordinator in 2012. Under Candle’s guidance as offensive coordinator, the Rocket offense was prolific. In 2014, UT led the MAC in just about every major offensive category, including scoring (36.6), total offense (490.5) and rushing offense (256.4), en route to a 9-4 record and a victory over Arkansas State in the GoDaddy Bowl. In 2015, the Rockets were 10-2 and ranked third in the MAC in scoring (35.0) and total offense (460.9). Candle was named one of the top recruiters in the nation by Rivals in 2010. He was named the Mid-American Conference “Recruiter of the Year” by Scout.com in 2011 and 2012. In 2014, Candle was one of only two MAC assistant coaches to be named by Rivals as being among the top recruiters in the Group of Five football conferences. Since taking over as head coach, Candle’s recruiting success has continued. Despite having just a few weeks to put together a staff at the conclusion of the 2015 season, Toledo’s 2016 class was ranked No. 2 in the MAC by ESPN. The 2017 Rocket recruiting class was rated No. 1 in the MAC by every major recruiting service. While most of the University will be closed during the winter break between the holidays, the Main Campus Pharmacy will be open normal business hours except a few days. Campus community members are welcome to stop in Wednesday through Friday, Dec. 27-29, from 8 a.m. to 4 p.m., as well as Saturday, Dec. 30, from 9 a.m. to 2 p.m. The pharmacy will be closed Monday and Tuesday, Dec. 25-26, as well as Monday, Jan. 1 and Monday Jan. 15. Normal business hours include being closed Sundays. “We want to continue to serve faculty, staff and students, and that means being here for them during the holidays,” Dr. Valerie Householder, manager of the UT Main Campus Pharmacy, said. The pharmacy will resume normal business hours Tuesday, Jan. 2. For more information, click here or call 419.530.3471. Educational, informative, fun and timely. Those are just some of the factors that have placed The University of Toledo’s social media content ahead of the pack. The University’s Facebook, Twitter and Instagram accounts were compared against 338 Division I programs, and the University was ranked 14th for its robust engagement. 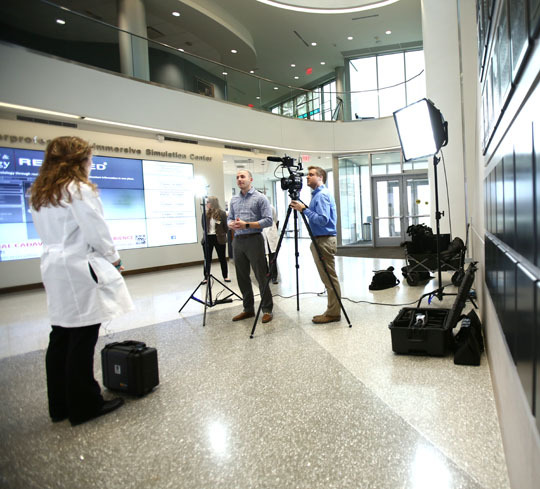 Vince DiGuglielmo, social media specialist, left, and Cam Norton, associate director for social media, taped a video on Health Science Campus. The UT team ranked No. 14 among 338 Division I programs for its social media efforts on the University’s Facebook, Twitter and Instagram accounts, according to Rival IQ. Rival IQ, a social media analytics company out of Seattle, compared social media engagement figures of university-level accounts from a 10-month period spanning August 2016 to May 2017. Social media engagement is commonly defined as an interaction on a social media post that can be measured by likes, comments, favorites, retweets, shares and reactions. Once data was gathered, results were weighed based on audience size, activity and engagement. Overall, UT placed 14th out of the 338 institutions. On Twitter, UT ranked No. 8, and the University had top 50 placements in Facebook and Instagram. UT was the only Mid-American Conference university ranked in the top 100 programs. 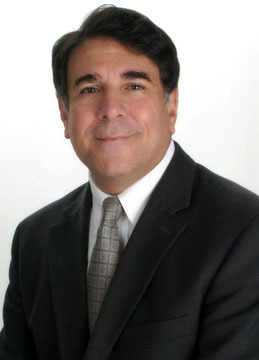 During the 10 months analyzed by Rival IQ, UT had several high-performing posts that aided in the ranking, according to Norton. Posts on research, graduation, sports victories and dogs generated the most engagement. UT has more than 53,000 followers on Facebook (facebook.com/utoledo), more than 59,000 people follow @UToledo on Twitter, and there are more than 12,000 followers of the uoftoledo Instagram account. To view the full 2017 Higher Ed Social Media Engagement Report, click here. 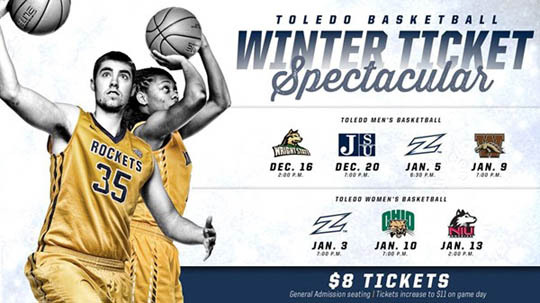 The Toledo men’s and women’s basketball programs will provide a holiday special to Rocket fans for seven different games over the next month. With UT students home for winter break, fans can sit in the bleacher seats for $8 (includes parking) for men’s games vs. Wright State Saturday, Dec. 16; Jackson State Wednesday, Dec. 20; Akron Friday, Jan. 5; and Western Michigan Tuesday, Jan. 9. For the women, general admission tickets are available for $8 (includes parking) for contests vs. Akron Wednesday, Jan. 3; Ohio Wednesday, Jan. 10; and Northern Illinois Saturday, Jan. 13. Ticket prices will increase to $11 on the day of the game. In conjunction with the bleacher-ticket specials, Star Wars Day will be held for the men’s game vs. Wright State Saturday. Read more here. The Rockets are teaming up with Leadership Toledo’s Students in Action for a toy drive. Fans are encouraged to bring a new, unwrapped toy to the UT game vs. Wright State to help make the holidays brighter for the special kids at Toledo Children’s Hospital. For ticket information, stop by the UT Athletic Ticket Office in the Sullivan Athletic Complex at Savage Arena, go online at utrockets.com, or call 419.530.GOLD (4653). The ticket office is open Monday through Friday from 8:30 a.m. to 5 p.m., as well as on game day. As the University announced in April, a new winter break schedule will be implemented this month, in response to feedback from employees over several years. This break will enable faculty and staff to rest and rejuvenate at a time when many departments are operationally slow — from Dec. 25, Christmas Day, through Jan. 1, New Year’s Day. • Monday, Jan. 1 — New Year’s Day (holiday). For departments with an area (such as a lab) that must maintain normal heating and/or requires other specific maintenance during winter break, leadership should immediately contact Jason Toth, associate vice president for facilities, at jason.toth@utoledo.edu to make these arrangements. Leadership members also are responsible for designating any specific employees who need to be on call and/or must work during winter break in order to provide essential services, such as to conduct research or provide services in the case of an emergency. Further, each department’s leadership should ensure appropriate notification of UT’s closure is provided to their customers and all affected service or product providers, such as vendors and contractors. Additional winter break details, including frequently asked questions, are available here. If you have any questions after reading the information on this webpage, talk with your supervisor or contact your human resources consultant. 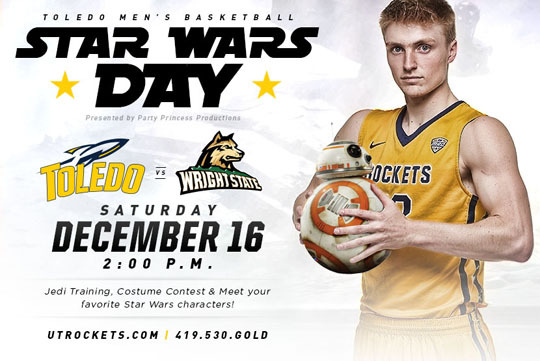 “Star Wars” Day will be held Saturday, Dec. 16, at 2 p.m. when the Toledo men’s basketball team hosts Wright State in a non-conference matchup. Fans can dress up as their favorite character from the popular film series and have their pictures taken during the first half and halftime with “Star Wars” characters Obi-Wan Kenobi, Darth Vader, Princess Leia and a Storm Trooper. Young Rocket fans also can take part in Jedi training in the Fetterman Gym from 1:15 to 2 p.m. The cost for the Jedi training is $7 and includes a game ticket, a light saber and a Jedi training certificate. Participants must be dressed up in a “Star Wars” costume; Jedi training is based on availability due to limited space. Jedi are members of a powerful order of scholars and fighters skilled in manipulating the universe with their minds. They are endowed with incredible physical and metaphysical strength, and their power is well-known everywhere in the galaxy. While they are tough fighters when necessary, they seek peace for the galaxy. They are always looking for ways to help those around them and keep the dark side at bay. A costume contest also will be held during the game with the winner announced during the second half. The Rockets also are teaming up with Leadership Toledo’s Students in Action for a toy drive. Fans are encouraged to bring a new, unwrapped toy to the game to help make the holidays brighter for kids at Toledo Children’s Hospital. For ticket information, stop by the UT Athletic Ticket Office in the Sullivan Athletic Complex at Savage Arena, go online at utrockets.com, or call 419.530.GOLD (4653). 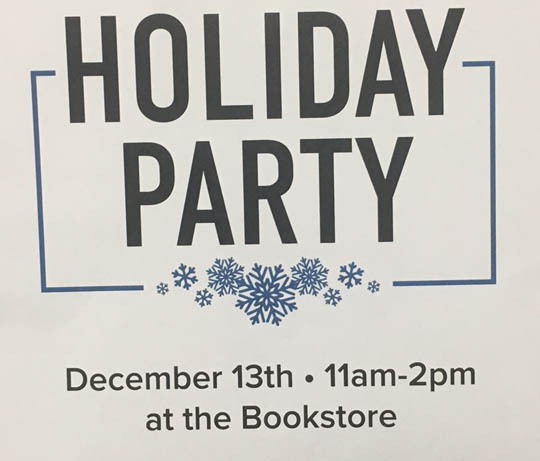 The Barnes & Noble University Bookstore at the Gateway will hold a holiday party Wednesday, Dec. 13, from 11 a.m. to 2 p.m. The event will have plenty of fun and free activities to help students take their minds off the stress of finals, according to Colleen Strayer, general manager of the bookstore. Stop by to hear from a Toledo Zoo education specialist, who will bring two small creatures and a touch tank. There also will be holiday-related games and crafts, and one licensed therapist will give massages. In addition, Rocky and Rocksy will be at the party and available for holiday photos. Did someone say free pizza? Grab a slice while the pies last.